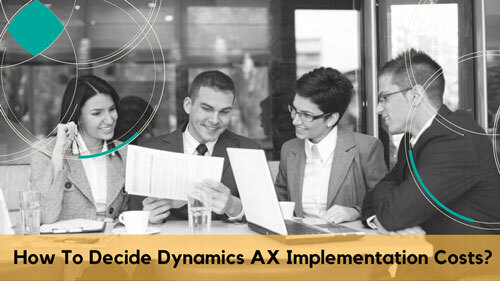 ﻿ How to Decide Dynamics AX Implementation Costs ? How To Decide Dynamics AX Implementation Costs? Businesses of the present day competitive and rapidly advancing technical world are witnessed to undertake diverse projects which imply varying services costs. The endless number of fields including finance, HR, and others are associated with their own sets of costs, covering development, implementation, configuration, as well as life-long maintenance charges. The implementation costs also are a by-product of the actual size of the company which further indicates the complexity of the business processes involved. A daunting task for the professionals, experts and authorities involved with Dynamics AX is decoding the best practices that will ensure a smooth, timely, and cost-effective implementation in the most efficient manner as possible. This has possibly out flown from the basic agenda of Microsoft Dynamics AX being to optimize the business processes built on the pillars of integration, advanced requirements, and security. The most striking component of this enormous amount is often owed to the consulting fees given up by the owners for the mass of expertise, knowledge, and skills utilized in the implementation process. The preference of most businesses to get these high-end systems customized as per their own needs and routine tasks/processes is the sole reason for such huge costs associated with the implementation. Tailor-made layouts which give a heavenly programming experience are simultaneously accompanied with the burdening responsibility of balancing the lifetime system implementation costs coupled with licensing expenses. Licensing is a much thought-provoking issue for most businesses which see them stuck among the numerous licensing formalities such as Microsoft Enterprise Agreement (EA), subscription licensing, etc. While most licensing costs for Microsoft dynamics AX consultants services are clear and one-time, others can be much mind-boggling. Apart from these, the need to train and even re-train the employees to upgrade their skills to the newly introduced systems costs money and sometimes, enough for wavering the decision to install. So just ensure you are all Prepared up before the next business process takes action and the costs start binding up!! Read More : Is it Easy or Tough to Schedule a Resource in Microsoft Dynamics 365?